Web Designing is the process of building and maintaining websites. 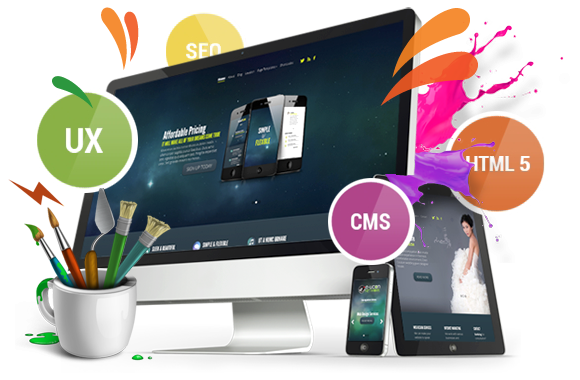 The process of creation of website has several aspects such as webpage layout, content generation and graphic design. Design and build beautiful and interactive websites by the principles of design like branding, colour theory, and typography which are all instrumental in the design process of a website. HTML (Hypertext Mark-up Language) and CSS (Cascading Style Sheet) are the two major components of web designing. HTML is mark-up language that is used to build webpages and content of the website. CSS is used for styling. CSS gives attractive and interactive looks and feel to webpages. Layout and appearance of each element of webpage depends on defined CSS. So, we can say that HTML and CSS are the basics of web designing. In 1993 Marc Andreessen and Eric Bina, created the Mosaic browser. At that time most of the browsers were Unix-based and text heavy. There had been no integrated approach to graphic design elements such as images or sounds. The Mosaic browser broke this mould. In 1994 Andreessen formed Communications Corp. presently known as Netscape Communications launched the Netscape 0.9 browser. Netscape created its own HTML tags without regard to the traditional standards process. In 1996, Microsoft released its own browser complete with its own features and tags. It was the first browser to support style sheets. W3C introduced CSS in December 1996 to support presentation and layout in websites. This allowed HTML code to be semantic and improved web accessibility. In Static web design, the website stores a unique file for every page of website. The same content is returned on every page request. The content on the website is created during website designing. Although some websites use an automated creation process, generally, the website is manually authored. These static web designing became more popular around 2015, with generators such as Jekyll and Adobe Muse. The benefits of a static web designing is that it is easy to host because server need to serve static content only. It does not execute server-side scripts. That is why it need less server administration and there is less chance of exposing security holes. It serve pages more quickly. The cost require for server hardware is low. Almost all websites have some static content. For example, images and style sheets are usually static, even on highly dynamic page websites. Dynamic web designing use server-side technology to generate webpages. It extract content from back-end databases. For dynamic page web design server-side and database coding required along with client-side user interface design. Now-a-days, dynamic web designing has become very easy with the help of CMS (Content Management System) that allows user to design dynamic webpages without much knowledge of programming. Administrator can edit the content of the website with ease by using third party software now. Web designers are the professionals who are hired for web designing and development. Web designers use a variety of different tools for web design. The selection for web designing tool depend on what part of the production process they are involved in. web designing tools are updated time-to-time with latest standards and software but the principles behind them remain the same. Both vector and raster graphics editors are used by web designers to create web-formatted imagery or design prototypes. Web designers may also use other tools including mark-up validators and other testing tools for usability and accessibility to be sure whether their websites meet web accessibility guidelines. Adobe Dreamweaver, Photoshop CC, Sketch, Web flow, GIMP etc. are some examples of web designing tools. Wireframe of a website is also known as a page schema or screen blueprint. It is a visual guide that represents the structural framework of a website. The purpose of creation of website wireframe is to arrange the elements to accomplish a particular purpose properly. The wireframe describes the layout of page or arrangement of content in the website. It include interface elements and navigational systems, and how they work together. Usually it lacks typographic style, colour, or graphics because the main focus lies in functionality, behaviour, and priority of content. The person generally create wireframe is business analysts, user experience designers, developers, visual designers, or by anyone expertise in interaction design, information architecture and user research. Layout: Layout of the webpage defines the way how graphics, ads and text are arranged. The main perspective of layout is to help the viewer find the information they seek at a glance. It include consistency, and integrity of the design. Colour: Colour selection depends on the purpose and client; it could be simple black-and-white to multi-coloured design, conveying the personality and the brand of an organization. Graphics: Graphics include logos, photos, clipart or icons that are used to enhance the web design. Appropriately placed graphics make website more attractive and eye-catchy. It must be used in such a way that not making it too congested or slow to load. Fonts: Various fonts can enhance website design. Most web browsers can read select fonts, known as “web-safe fonts”. So, web designer must use these web-safe fonts. Content: Content and UI design work together to enhance the message of the website through visuals and text. Content of webpage must always be relevant and useful. SEO content with suitable length, incorporating relevant keywords make website ranking high. Website designing is a subset of web development. For any assistance regarding Web designing and development feel free to contact MSA Technosoft. You can easily hire an expert to build your own website with MSA Technosoft. Must share your views on blog in comment box below.